This is a fish dish I have made a few times since I got back from St. Thomas last month. I bought some spices while I was there and on the back of one of the bottles was this recipe. 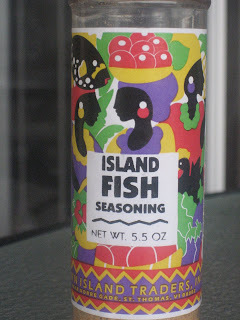 The spice mix is called Island Fish Seasoning and is made by Down Island Traders in St. Thomas. If you want to try to make this seasoning at home its ingredients are salt, onion powder, garlic powder, dry mustard, pepper and paprika. I served it with a side of sauteed sugar snap peas and a cauliflower casserole that turned out pretty good for a last minute recipe search. I am really trying to like cauliflower, sometimes I do, but lately roasted or steamed cauliflower just doesn’t sound applealing to me. I will probably make this casserole again, maybe lessen the amount of mayonnaise used next time. Combine all ingredients. Marinate for 1 hour. 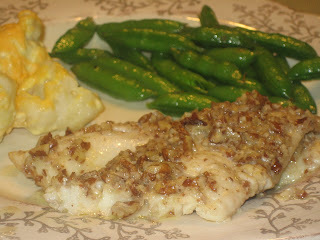 Place fish in lightly greased baking dish and spoon pecans and marinade over each filet. Cover with foil tightly and bake for 20 minutes at 350 degrees. In a large saucepan, bring salted water to a boil. Wash, trim and core the cauliflower, break up. Cook in simmering water 12 – 15 minutes until fork tender. Drain well. In a small bowl, combine mayonnaise, mustard, minced onion. Spread mixture over cauliflower. (Here I stirred together cauliflower and mixture, also some of the cheese, in a bowl before pouring into small baking dish). Sprinkle with cheddar cheese. Bake 3-5 minutes uncovered. (I left it a bit longer, closer to 10 minutes). Serve hot. « Previous PostRocky’s Pizzeria is finally here!